Baby Boy Gift Bag by Rufus Rabbit. A lovely way to deliver Rufus Rabbit with a smile. 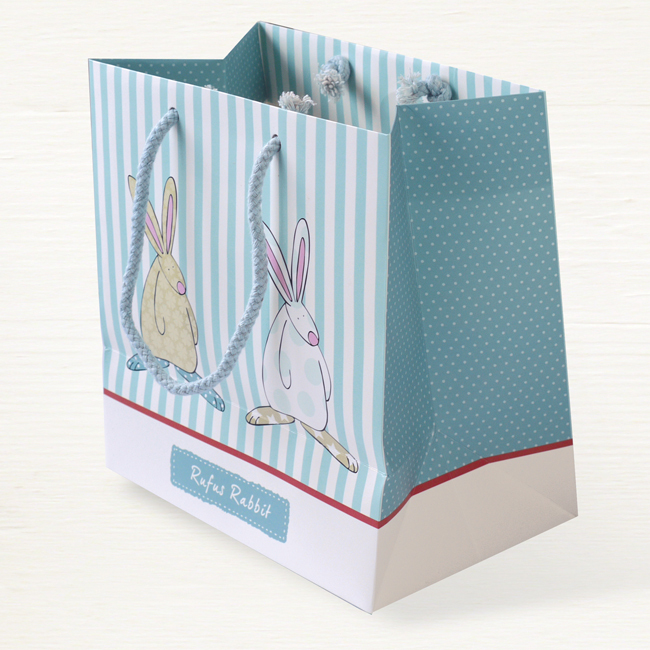 Our baby boy gift bag by Rufus Rabbit is medium sized and has cotton cord handles. It is a perfect size to hold a combination of two Rufus gifts. You may wish to give a gorgeous mummy mug with our best selling rabbit baby rattle. Or how about a money tin and a deluxe dribble bib? If so, then this gift bag will do the job with style. A simple, yet lovely way to deliver Rufus with a smile. We also have a section of newborn baby cards to help complete your gift. Happy browsing!